Flaunt Your Fronds in Palm Trees—Coming Soon! 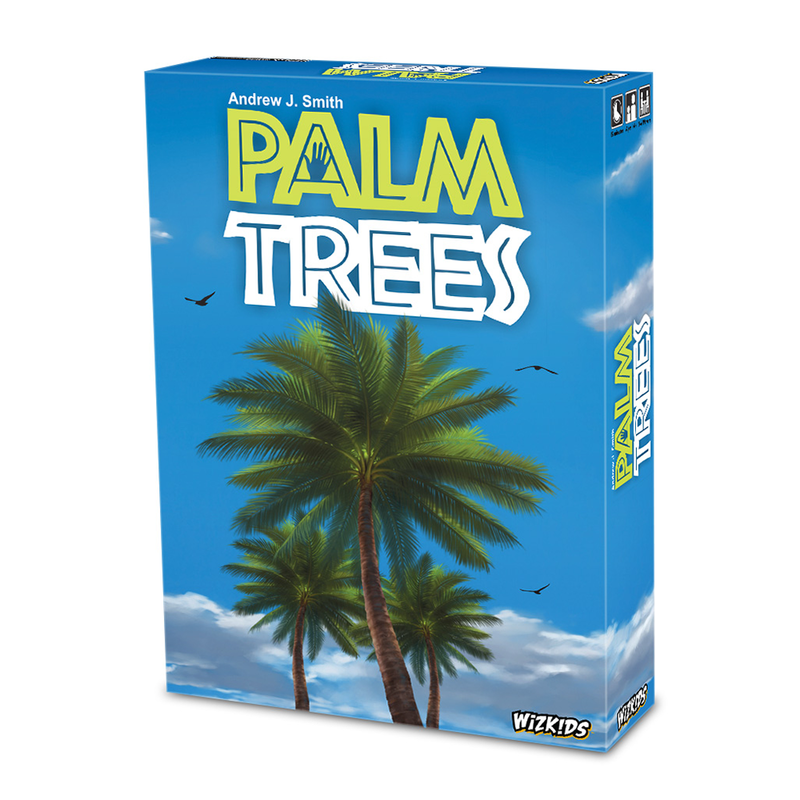 Hillside, NJ – March 19, 2019 – WizKids is pleased to announce the upcoming release of Palm Trees, its new dexterity game of lush leaves and fabulous fronds! In this dexterity game of quite literal “hand management,” players compete to grow the most verdant trees on a tropical island. To start, players will place their elbows on the table, arms straight up, forming the trunk of their palm tree. Each player holds a number of cards, representing fronds and coconuts, in their hand. Each card indicates the way in which the player must add it to their hand. Frond cards are simpler, while coconut cards tend to have more difficult rules players must follow. Each turn, a player will select one of three available cards on the table to have an opponent add to their tree. Each card has a rule on how it must be held: frond cards are simpler, while coconut cards have more difficult rules. Some cards require a player to hold them between two specific fingers, or potentially between their fingers and their palm. When a card is added to a player’s palm tree, they must continue to follow the rules indicated on all the other cards in their hand. Breaking any of these rules would be considered dropping a card, which ends the game. If the game ends with a dropped card, the player who dropped the card will not score any points for that game. The game also ends when all cards have been placed in all trees. When the game ends, players add up the points on each of the cards in their respective hands, and the player with the most points wins! The game can also be played teams of two, with one player acting as the tree while the other adds the fronds and coconuts. In this alternate way of playing, each team simultaneously builds their tree instead of taking turns. The game ends as normal. For extra fun, 6 tree trunk tattoo sleeves have been included with the game—these can be worn by players for extra immersion into the mind of an island tree. Palm Trees will release in June 2019, so be sure to preorder at your Friendly Local Game Store or online today!